It’s been a while since I sat down to write a blog. 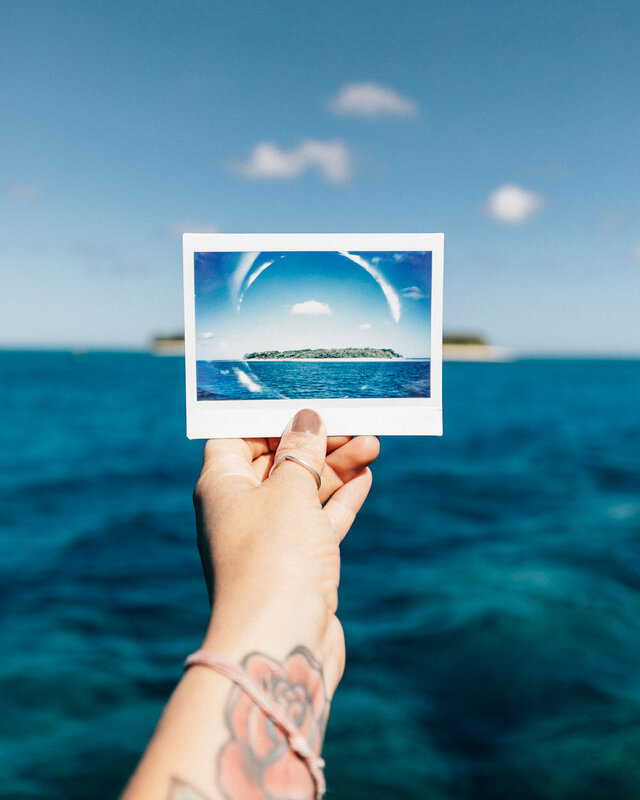 Like most creative’s and particularly in the travel industry there is a never-ending “to do list”, which can be harder to navigate and complete whilst constantly on the go. However, I am glad my first blog back in a while is from a very recent escape in my own back yard - my sunny home State. The heart of world’s most remarkable living ecosystem and nursery for all life in our oceans; The Southern Great Barrier Reef. If you’ve been around for a while you might remember my trip up north last year and previous blog post (here), you might already be aware of my fascination /or obsession with the underwater world. The breathtaking beauty of the Great Barrier Reef just blows me away. It is the only living structure on our planet which can be seen from outer space, the biggest single structure made up by living organisms and the first coral reef ecosystem to be awarded World Heritage Status. Right here! Just a half-day drive from the place I am lucky enough to call home and I was ready to return for a new adventure. 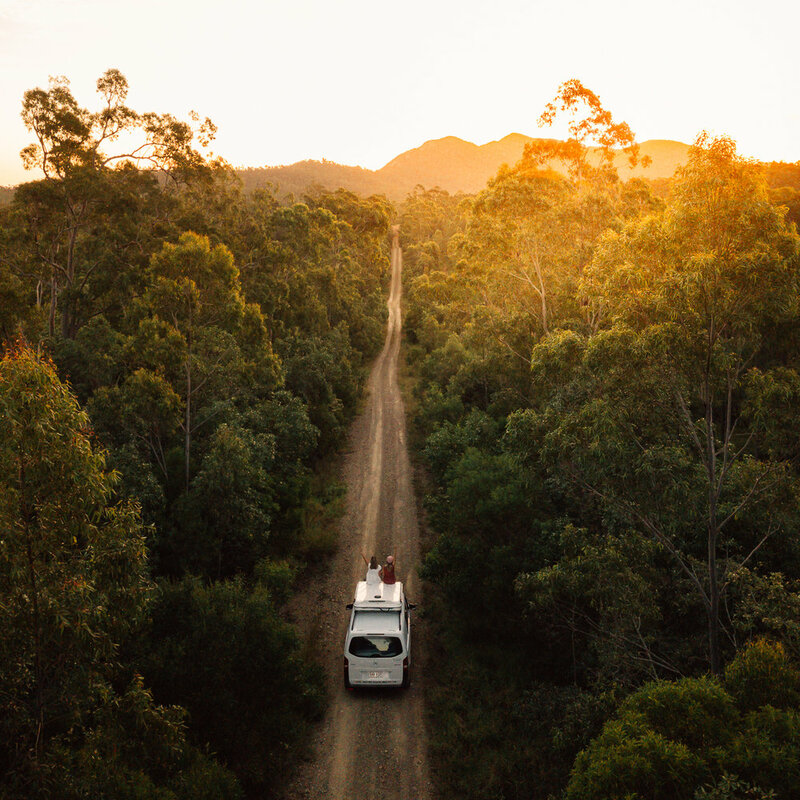 We landed in Mackay, with an itinerary that begun there and saw us driving the length of the Southern Great Barrier Reef, stopping at the local regions to explore. We picked up our home on wheels for the week (which later was renamed to Lenni) and set out straight towards the sub-tropical rainforest, for an afternoon spent by the enchanting Araluen Cascades at Finch Hatton Gorge. Hayley (my new travel companion) lives 10 minutes away from me at home and we have mutual friends, but we’d never met until the morning of this job. Funny to think that we were essentially strangers who were about to spend the week road tripping and working together in such an intimate space, but the moment she walked into my life I felt a great sense of familiarity. It really wasn’t long before we were sharing everything - meals and our life’s stories- singing along to music blasting through the stereo and laughing so hard we were literally crying. I think the best connections are made on the road. They can be immediately palpable. There is that feeling like you have known someone forever and it is almost as if real “time” becomes irrelevant. Aligning with one another in a unique way, being stripped away from your usual, whilst physically experiencing new, contrasting environments. You begin collecting moments together. An encounter that is pretty popular with tourists - an iconic Australian experience and a view that is absolutely worth waking up for. From here we hit the road heading down towards Yeppoon, stoping only to have a roadside breakfast of peanut butter oats and a quick tour of the Sarina Sugar Shed. We arrived at our destination just in time to enjoy the golden glow of sunset in the picturesque Byfield State Forest. A place I would definitely love to see more of and spend more time exploring the sand dunes, rainforest edged creeks and those rugged mountains. Great Keppel Island is an undiscovered treasure, with 17 pristine beaches of unspoilt bushland and pockets of fringing reef. We spent a quiet day relaxing here with our local guide Geoff, showing off all the highlights and even taking us out on his personal boat. On our third day we rose for sunrise and a female Emu greeted us in the caravan park. I couldn’t believe my eyes when I saw her strolling past out van as I was coming back from dishes duty. Some of the staff members later told us she had been visiting for the last 20 years and her name was Ernie. Definitely a unique experience to wake up to and I say this all the time, but Australia is seriously so incredible. Where else could you be casually sharing a meal with an Emu walking past? Just amazing! We set out early, with full bellies and ready for another mini road-trip to Agnes Waters - the home of the famous 1770 sunset. I’ve been fortunate enough to see a few of these places before and I was really looking forward to getting back to the beaches here. When we arrived we had a quick bite to eat at Getaway cafe we were told by some locals a few good spots to check out before the sun set. Hayley and I head straight for the Paperbark forest, which is an easily accessed trail off the side of the road that was absolutely and unexpectedly magical. 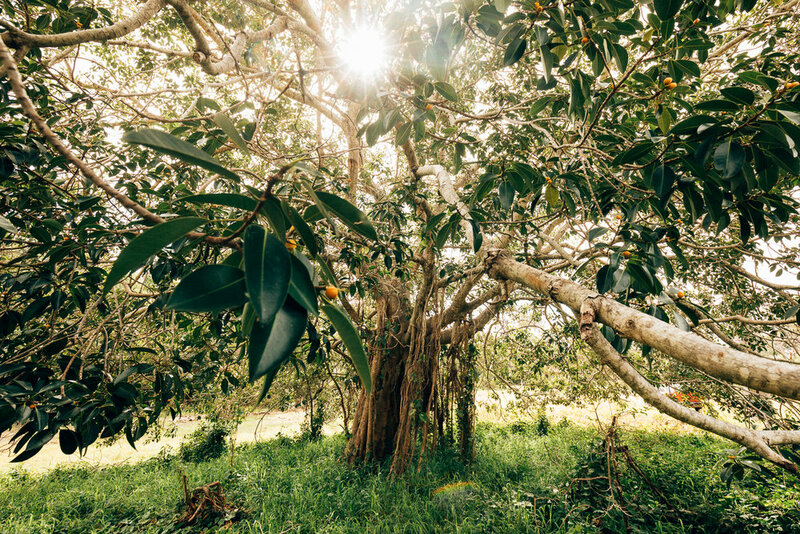 We arrived at the perfect time of day as butterflies swirled around us and the sun was twinkling through the thick wetland of hundreds of paperbark tree trunks and majestic green cabbage palm frongs. After checking out a few of the other beaches we head for 1770 foreshore to take in the last light of the day in one of only a few places on the east coast of Australia where you can enjoy the sunset over the ocean. We twirled around, frolicking in the calm water and spent an evening in Lenni eating pizza, with a glass of red wine, under the incredible night sky. Wallaginji means “beautiful reef” and Lady Musgrave Island couldn’t be more perfectly described. A vast, calm turquoise lagoon and island paradise unique to the entire Great Barrier Reef as the only coral island with a navigable lagoon of its kind. Set on 3000 acres of living reef in a protected Green Zone Lady Musgrave offers an abundance of marine life and a lifetime experience to get up close and personal with the locals turtles. We travelled with Lady Musgrave Experience and truly couldn’t recommend the experience enough! The staff we amazing and there was ample time to explore the 8km island, enjoy a glass bottom boat tour, a delicious feast and spend hours of snorkeling (or diving) the remarkable reef. I couldn’t wipe the smile off my face that afternoon, feeling truly lucky to experience a moment with Hayley and the turtles below. The next day we rose to the sound of birds and a stunning 360-degree pink sky - my favourite. I literally rolled out of Lenni at Agnes Water Beach Park and onto the beach with my camera in hand and observed as the surfers and morning yogi’s went about their daily routine. We decided to treat ourselves to a morning picnic breakfast on the cliff top over looking a secret bay, before getting under the waves and playing with my water housing. Waking up in Bundaberg, we devoured a drool-worthy and very notable breakfast of (vegan) sweet potato pancakes with cinnamon and homemade gelato before heading out for a day experience the pure magic of Lady Elliot Island; a place I have been waiting to visit for years. Just north of Fraser Island and home to the mantra ray, Lady Elliot is regarded as one of the best snorkelling destinations of the Southern Great Barrier Reef, with an amazing array of colourful coral and marine life. Another place I need to add to the list to return to stay and explore longer. I would seriously love the chance to spend the night, see the Milky Way from this remote location and swim with the manta rays. Waiting for us upon return was the most exquisite evening picnic at Sandcastles on the Beach hosted by Nourish café. We couldn’t have felt more treated, sitting down ocean side with candles and fairy lights to one of the best picnic’s I’ve had in a long time. Truly a beautiful way to end a perfect day and a huge week on the road. All good things come to an end and so we embarked on the journey home. Driving back to Brisbane and very sadly we parted with Lenni before returning to the Gold Coast. Home with an ever-heightened love and appreciation for this incredible land, so many new memories and clarity that allows a deeper sense of self with the lingering connection to country.